Jeelight 2.0 Release - Control Yeelights from PC. Fans of Yeelight, the brand of smart lights under Xiaomi’s umbrella, have plenty more to rejoice about lately. 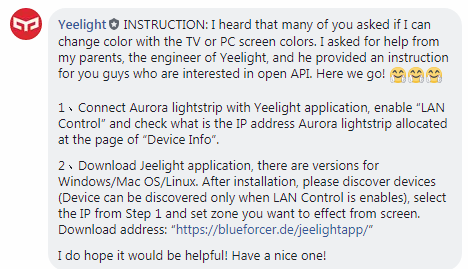 Not only were the latest Yeelight Aurora Strips globally launched today, the Jeelight app for PC was updated to beta version 2.0, which brings a ton of new features not found anywhere else, including in the official Yeelight app for Android. We talked about Jeelight briefly in a how-to guide “How to Get Xiaomi Yeelight Music Mode on PC” last week, but at the time, Jeelight was only a beta demo with a time limit that could not be removed. However, the latest version of Jeelight offers a premium version which unlocks the timer, and allows up to 8 Yeelights to be controlled simultaneously. 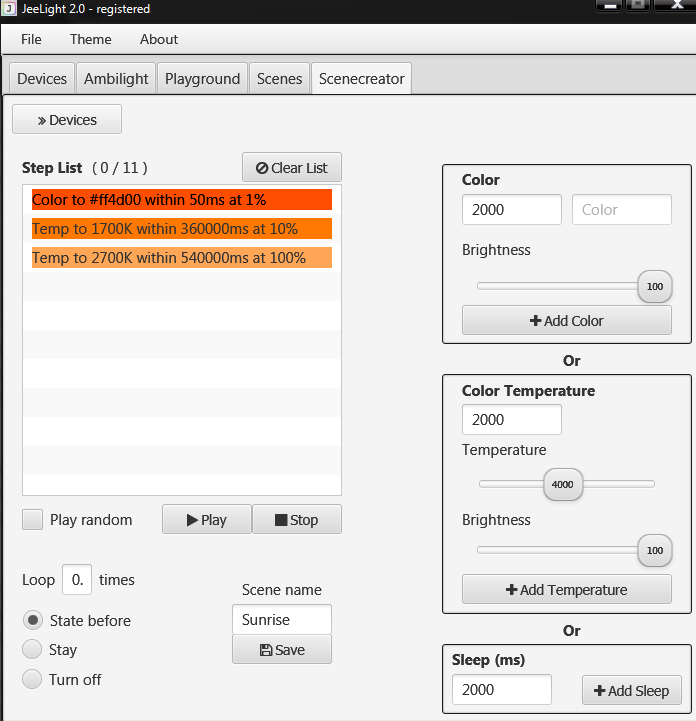 JeeLight scene editor and creator for customizing Yeelight steps. This is of significant news for Yeelight community, as the previous most popular PC controller for Yeelights, Yeelight Toolbox, is only capable of controlling a single individual light – though the developer of Yeelight Toolbox promises to add new features. However, Jeelight has added a ton of new features in the past week alone, including the ability to customize room scenes, apply them to lights individually, and even share and download presets with other Jeelight users. It has quickly become the most powerful tool for controlling Yeelights from PC, and the developer promises even more features to come. Dominant color finding in Ambilight (screen monitoring) mode. An uploading and sharing area for Scene presets, which means users can download presets from each other. While there’s a ton of Android and PC apps for the more expensive Philips Hue and LIFX brands of smart lighting, Yeelight is more popular in the Asia and India region – individual Yeelight RGB bulbs only cost around $25 per bulb with no “kit” necessary, compared to Philips Hue which requires a $200 starter kit just as an initial investment. With Yeelight’s Aurora Strip Plus being globally launched just recently, including their new line-up of RGB strips up to 20 meters in length, it’s going to be very interesting to watch how things develop as far as competition between Philips Hue, LIFX, Yeelight, and the development communities surrounding those brands.